32" x 24.50" image size The Wheels of Life is Markus Pierson’s first serigraph to incorporate the artist’s “found-objects”, one of the most sought after elements of Pierson’s original paintings and sculpture. Here, the weathered gears from a vintage motorcycle form a playful metaphor for our lives. The gears are a reminder that nothing lasts forever and that what was once new will eventually weather. 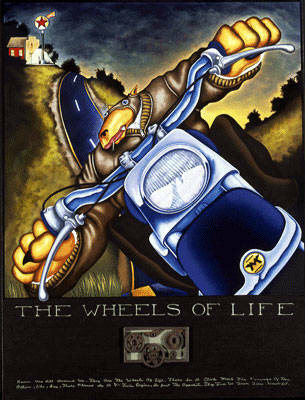 The Wheels of Life is a call to action, a compelling tap on the shoulder to find life’s open road and pursue our dreams. Life’s wheels and gears may continue to turn; however, it is where we choose to ride them that will determine the direction of our lives. Under the wonderful found object Markus writes: “Gears are all around us. They are the wheels of life. Those in a clock mark the passage of time. Others, like, say, those places in a V-twin engine do just the opposite. They free us from time. Wonderful!” Those that know Markus, know his love of the Matchless emblem. Here is it displayed prominently on the front fender. It can also be found on an amazing sculpture titled “Midnight Rider”. I encourage you to view this piece as well. I think you’ll love it! Serigraph on board 32" x 24.5"